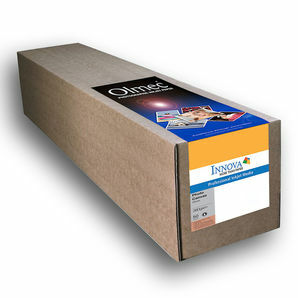 Olmec OLM36 Photo Canvas Gloss 380gsm features a natural white base with a brilliant microporous glossy coating which is both touch dry on printing and water resistant. The results are enhanced tonal range and D-Max. Colours are given an extra vibrancy on this textured true polycotton canvas weave which is also capable of outstanding replication of the deepest shadows within your images. This true polycotton canvas includes flexible properties enabling prints to be stretched cleanly around wooden stretcher bars without cracking the surface making it an ideal choice for exhibition displays.